•	Airplay not working on PopcornTime after update to 7.2? •	Apple TV 7.2 doesn't allow streaming from Popcorn? •	Popcorn time can't find Apple TV? •	Airplay stopped working with popcorn? •	Popcorn Time doesn't see Apple TV on OSX 10.10.423? If you find the above problems are what you are encountering, then you are at the right place to get them solved! Click to view and solve other PopcornTime not working problems. DearMob 5KPlayer seeks to become the major player in the field of AirPlay compatibility to deal with any AirPlay not working problems. If your Popcorn Time turns out not streaming to Apple TV, one of the most convenient and direct ways is to get yourself a 5KPlayer. You may wonder what is exactly going wrong with popcorn not AirPlay Apple TV issue; is it PopcornTime or the new ATV? Or maybe both? But, diagnosing the devices without a professional fixer can be really hard. Here is what we can do with the software. How to Solve Popcorn not Stream to Apple TV? As AirPlay has rolled back into the newest version (3.8.2) of PopcornTime (.io), it seems that you do not need to test through all the workarounds provided in the popcorntime forum to make popcorn AirPlay Apple TV work again. Download the latest version of popcorn time and check if that version of popcorn handles AirPlay smoothly on your computer. However, some of you may still stuck in the dark with the latest version of popcorn not showing AirPlay Apple-TV. 3. Make use of 5KPlayer freeware from DearMob if you are still troubled by 0.3.8 Popcorn not stream to Apple TV. 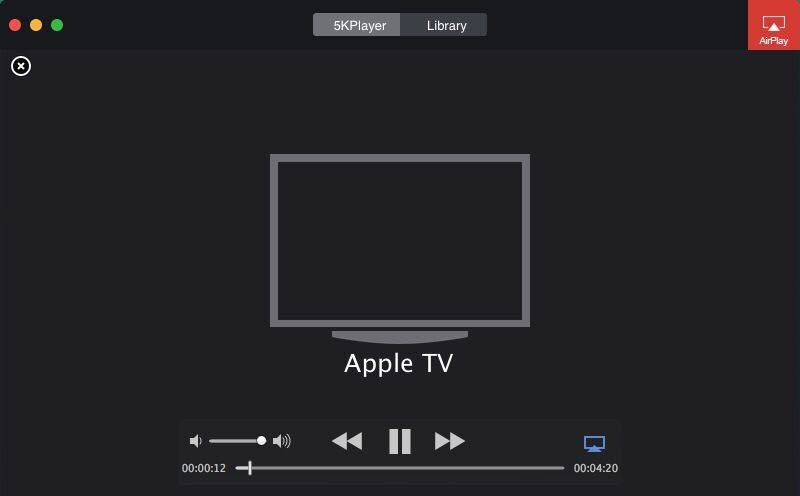 This is a whole replacement of PopcornTime, 5KPlayer utilizes the bonjour protocol to enable both your Mac and Windows PC to stream videos to Apple TV and receive streams from iPhone/iPad/iPod/Apple Watch. The upgraded 5KPlayer Mac version added mirroring and screen recording function to help mirror and record iDevices/Mac screen, which multiplies the Apple AirPlay allowed paths. So, if you are a PopcornTime mobile user, you can always get the videos recorded and saved in the computer instead of in the storage strapped little phones. Also, DearMob 5KPlayer supports up to 4K/8K UHD video stream and download, able to blow your eyes off with best visual presentation plus a big TV screen. With 5KPlayer, you can free download bunches of TV series, movies, music videos and songs from over 300 online sharing sites like StupidVideos, Metacafe, Soundcloud, Onlinemovies.pro etc. Besides, it is reported that though Popcorn to Apple AirPlay starts to work well with the newest build, subtitle still fails to function. 5KPlayer fills up that gap for you. You can add subtitles to the video through 5KPlayer and then AirPlay to Apple TV/Mac/Windows. How to Use 5KPlayer to Replace Popcorn AirPlay to Apple TV? Step 1. Download and run this Popcorn media player -5KPlayer Mac and Windows version on your computers respectively if you haven't yet, to replace PopcornTime AirPlay to Apple TV. *Instead of playing videos first, you can enable AirPlay to Apple TV in advance! Step 2. Click the AirPlay button on the up-right corner, and select Apple TV as the AirPlay receiver in the popup menu. *Note to connect your computer and Apple TV the same wifi network. The AirPlay button, which when goes red, indicates a successful AirPlay Mac/Windows to Apple TV experience. Step 3. Open a video file you want to play and it will be directly streamed from Mac/Windows 10/8/7 PC to Apple TV. Note: Make sure that the files are AirPlay compatible; otherwise, you may need to get proper convert software to have those files converted. DearMob 5KPlayer manifests the most diversified and flexible streaming & AirPlay approach to make it a worthy alternative to iron out problems of Popcorn not AirPlay Apple TV. Movies and videos can be seamlessly streamed from Windows 10 and Mac (EI Captain) to Apple TV. Why AirPlay Not Working on iOS 9? Learn to solve AirPlay not working from Mac/PC to Apple TV, or from iPhone/iPad iOS 9 to Mac/PC through this tutorial.